Why Choose Camp Belly Rub for DogGIE Daycare? 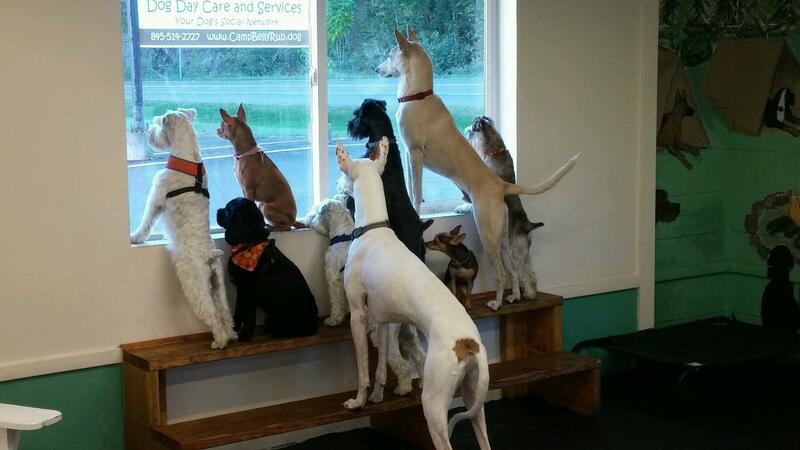 We ensure all dogs are daycare friendly. All dogs go through an evaluation before they can attend daycare. The evaluation focuses on how the dog reacts to different types of dogs and the daycare attendants. Before a dog can be boarded, he/she must attend several sessions of daycare to ensure they will enjoy their vacation while their parents are away. The initial evaluation is free of charge. We group dogs into play areas to ensure safe, compatible play. We separate dogs into playgroups based on temperament, size, age, and personality among other factors. Every dog is assigned a primary playgroup. We actively manage our playgroups to engage the dogs. We hold special events and themed days to provide even more fun. Just like camp, our daycare schedule is structured to provide specific times for daycare tested toys, walks if needed, and even naptime. Naps are key to manage the arousal level of the playgroups and to give each dog some “quiet time” and dogs are given every opportunity to snuggle up and nap in the quiet areas. Some of our events are: birthday parties, doggie weddings, bubble days and craft days. We focus on building long-term customer and dog relationships. With every stay you should expect a recap directly from the staff at pick up or in a more formal method, report cards .You can call us at anytime to check on your dog. We also offer 24/7 access via our camera app so you can watch your dog throughout their stay. We strive to get to know your dog better with each visit and have an internal process to share that information across our daycare team. If we notice any behavior changes, we share that information with you and can adjust your dog’s activities or have our Dog Training team recommend options. We want to exceed your expectations and if we don’t, we will do our best to work with you to fix it. We are family owned and operate and We know dogs. Our owners are just like you, passionate and concerned about the well being of their pets, this translates to being passionate about yours. Our staff is certified in Canine First Aid and CPR. 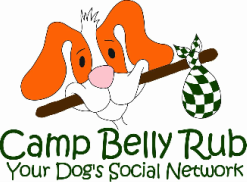 Camp Belly Rub is a woman owned business. Camp Belly Rub continues to grow based on our clients needs and the demands of the market. We strive top remain responsive and flexible to better accommodate you and your lifestyle. Our ability to individualize service and resources makes any stay at Camp Belly Rub uniquely positive. Both Lynn & Tracey are always available to receive and act on your feedback. Our owners have extensive experience in working with canine rescue organizations from transports to fostering to home placements. At the end of day, we know it has to be a good match to be a great relationship. Our facilities are available to rescue organizations, please inquire. Your dog's social network! They can come and make their own friends. 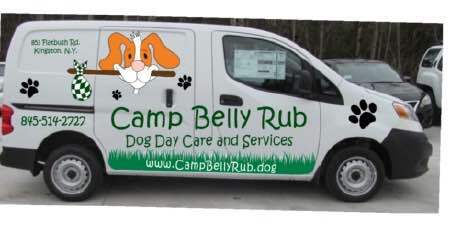 For your convenience, Camp Belly Rub offers pet pickup at several convenience locations.